Stigmata by Colin Falconer dropped through my letterbox rather unexpectedly, sent by the publisher for review. I didn’t recall expressing interest in it, but never one to say no to a book, I had a look at it. Set in the Languedoc, its main characters are Philip of Vercy, a knight who has lost faith following the deaths of his wife and son, and Fabricia, a young woman who sees visions and is marked with the stigmata, which also seems to give her healing powers. Both become embroiled in the Cathar cause, and the siege of Montaillat, as Simon de Montfort tries to wipe out the heretics. Despite it being unexpected, Stigmata did sound like a novel which would interest me. The synopsis made me think of Kate Mosse’s Labyrinth; although the story is not that similar, it too deals with the Cathars, and is one of my favourite novels. The story of Stigmata is intrinsically religious. With the Catholic Church attempting to wipe out the Cathars, Philip’s questioning of his religious beliefs and whether his god is good after the loss of his beloved wife and son, and the mysterious stigmata wounds that Fabricia has, everything is related to religion. Life at the time was built around religion, whatever that religion might be, and it is perhaps for this reason that the religious aspects of Stigmata didn’t bother me. Often I feel uneasy and uncomfortable reading about religion, particularly Christianity, a feeling which also manifests itself in churches and cathedrals, yet religion is a key part of the setting of any novel set in France in the 13th century, so it seemed normal. Stigmata is packed full of action as Philip searches for Fabricia, who he has heard can heal illness and injury, and he hopes she can heal his son. The pair are then on the run from the Catholic crusaders, seeking to wipe out the Cathars, and of course they are involved in the siege of Montaillet. The action is well paced and well written, yet for some unknown reason I always felt like I was waiting for something to happen – even in the midst of reading about a battle. I can’t pinpoint why this was, why it felt liike the story never fully got going, but clearly there is some vital spark missing from Falconer’s writing; the story is never really “unputdownable”, and never fully gets a grip on you. That said, Falconer’s writing is good. 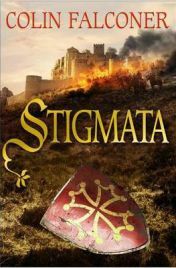 The dialogue of the characters and the style of writing do immerse you in southern France in the 13th century, and this is maintained throughout Stigmata. The sense of time and place, so important to a novel about the Cathars, is solid and believeable. I enjoyed Stigmata, I certainly would not say that I didn’t, but it did lack that certain something which would have made it a real page-turner. Having read it, I now want to reread Labyrinth, which is an excellent and truly gripping novel set in the Languedoc at the time of the Cathars. Published by Atlantic Books, August 2012. Many thanks to Atlantic Books for providing a review copy.